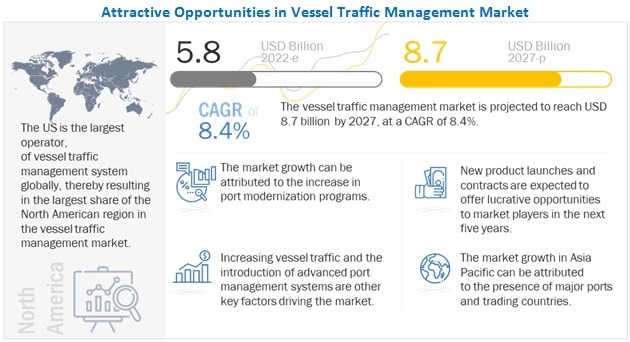 [248 Pages Report] The Vessel Traffic Management (VTM) market is estimated at USD 2.81 Billion in 2017 and is projected to reach USD 4.12 Billion by 2023, at a CAGR of 7.50% from 2018 to 2023.The base year considered for the study is 2017 and the forecast period is from 2018 to 2023. The report analyzes the vessel traffic management market on the basis of component, (equipment, solutions, and service). Equipment is further segmented into communication (VHF communication, RF communication, microwave & network, HMI, servers), navigation (radars, AIS, direction finders), and surveillance & monitoring (sensors, CCTV surveillance cameras, UAVs). Similarly, the solution segment is further segmented into sensor integrator, routing monitor, e-navigation, and multi sensor tracker. The service segment is further segmented into maintenance and operating service (information, traffic organization, navigation advice and assistance). The vessel traffic management market by investment is segmented into brownfield and greenfield. Brownfield and greenfield are further segmented into public sector and private sector projects. By systems is segmented into port management, and information systems, global maritime distress safety systems, river information systems, and AtoN management & health monitoring systems. By end user is segmented into commercial (inland port, port & harbor, fishing port, and offshore) and defense sectors. These segments and subsegments have been mapped across major regions, namely, North America, Europe, Asia Pacific, Middle East, Africa, and Latin America. The report provides in-depth market intelligence regarding the market dynamics and major factors influencing the growth of the vessel traffic management market (drivers, opportunities, and industry-specific challenges), along with an analysis of micromarkets, with respect to individual growth trends, prospects, and their contribution to the overall market. The report also covers competitive developments, such as long-term contracts, partnerships, expansions, new product launches, agreements, and research & development activities in the vessel traffic management market, in addition to the business and corporate strategies adopted by key market players. Market size estimation for various segments and subsegments of the vessel traffic management market was arrived at by referring to varied secondary sources, such as press releases, company annual reports, International Marine Organization (IMO), International Chamber of Shipping, International Association of Marine Aids to Navigation and Lighthouse Authorities (IALA), white papers, publications, industry outlooks, and corroboration with primaries, and further market triangulation with the help of statistical techniques using econometric tools. All percentage shares, splits, and breakdowns were determined using secondary sources and verified through primary sources. All possible parameters that affect the market have been accounted for, viewed in extensive detail, verified through primary research, and analyzed to acquire the final quantitative and qualitative data. This data is consolidated with detailed inputs and analysis from MarketsandMarkets, and presented in this report. The ecosystem of the vessel traffic management market comprises raw material suppliers, component manufacturers, simulator manufacturers, distributors, and end users. Some of the key players in the vessel traffic management market are Kongsberg (Norway), L3 Technologies (US), Transas (Ireland), Saab AB (Sweden), Thales (France), Rolta India (India), Japan Radio Co. Ltd. (Japan), Frequentis (Austria), TERMA (Denmark), Tokyo Keiki Inc. (Japan), Indra (Spain), Leonardo Finmeccanica(Italy), and Kelvin Hughes (UK). These players have adopted contracts, new product developments, and agreements & partnerships, as their strategies to strengthen their positions in the vessel traffic management market. 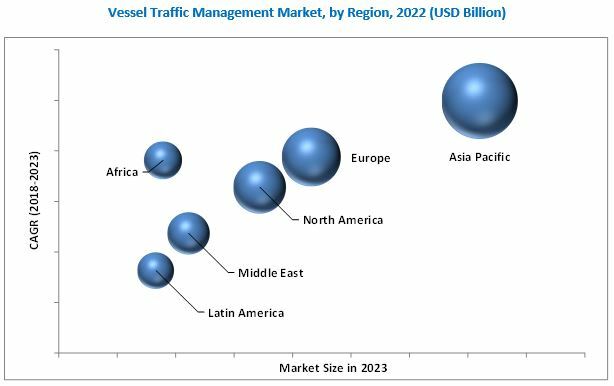 The vessel traffic management market is projected to grow from an estimated USD 2.87 Billion in 2018 and to USD 4.12 Billion by 2023, at a CAGR of 7.50% during the forecast period. This growth can be attributed to the rise in maritime situational awareness and safety. Increasing focus on port security for illegal immigration and terrorist activities is also influencing the growth of the vessel traffic management market. Based on component, the equipment segment is estimated to lead the vessel traffic management market in 2017. Growth of this segment can be attributed to increase in the adoption of Automatic Identification Systems (AIS) and VHF communication systems CCTV surveillance cameras, Radars (X- and S-band) in ports and offshore platforms. Based on systems, the port management information systems segment of the vessel traffic management market is estimated to lead the vessel traffic management market during the forecast period. Growth of this segment is driven by factors, such as increase in port expansions due to vessel congestions at ports. Based on investment, the brownfield vessel traffic management segment is projected to grow at the highest CAGR during the forecast period. This growth can be attributed to saturation of vessel movements in ports. Based on end user, the commercial segment of the market is projected to grow at the highest CAGR during the forecast period. The increase in sea trade, rise in commercial vessel around offshore, fishery ports, and inland waterways are expected to drive the demand for commercial vessel traffic management. Asia Pacific is estimated to lead the vessel traffic management market in 2018 and is projected to continue to lead during the forecast period owing to the rise in port expansion and port development projects. The vessel traffic management market in the Asia Pacific is projected to grow at the highest CAGR during the forecast period, owing to the increasing sea transport, and government involvement in coastal and port security. High cost of the Vessel Traffic Management (VTM) equipment and installment, and maintenance on yearly basis is restraining exponential market growth. Major companies across the globe providing vessel traffic management systems are Kongsberg Gruppen (Norway), L3 Technologies (US), Transas (Ireland), Saab AB (Sweden), Thales Group (France), Rolta India (India), Japan Radio Co. Ltd. (Japan), Frequentis (Austria), TERMA (Denmark), Tokyo Keiki Inc. (Japan), Indra Sistemas (Spain), Leonardo Finmeccanica (Italy), and Kelvin Hughes (UK). New product developments, acquisitions, and contracts are the major strategies adopted by these players to retain their positions in the market.